We are getting used to this 'living on the mainland again' thing, my friends. First, the fact that it's summer and that means a change in the weather is a relatively new concept. Second, we've been exploring this 'bigger' island with road trips, quick flights, weekend getaways, and camping. We recently visited with Bryce's Aunt and Uncle in Couer D'Alene, Idaho. After his Dad visited us here in Seattle, we all traveled East for the July 4th weekend. Now we did camp a few times in Hawaii, in a tent directly on the beach so the change of scenery and accommodations was quite vast! As you may have picked up from the camping in Hawaii post, Mountain Pies are my go-to campfire meal. I'd recently asked on Facebook if there was another name for these tasty campfire sandwiches but there doesn't seem to be! As a kid I can remember having pizza mountain pies as well as ones filled with canned pie filling, which are both delicious, although I've really been stepping up the Mountain Pie ingredients lately. 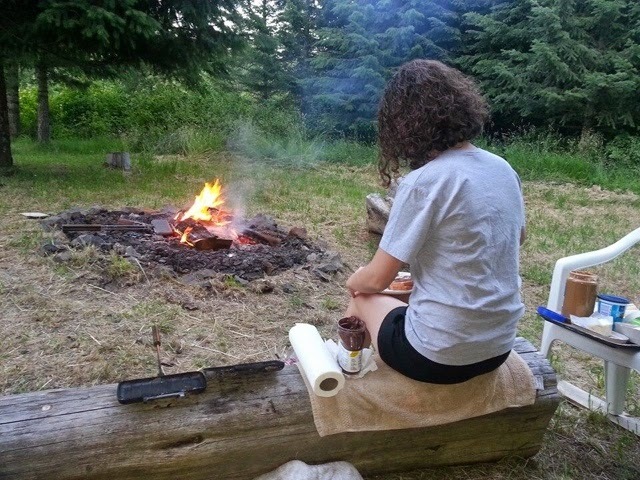 In addition to my tasty cider, a must have for campfire cooking, we were equipped with (room temperature) butter, sliced bananas, apple pie filling, parmesan cheese, pizza sauce, marshmallow fluff, nutella, salami, mozzarella cheese, a loaf of square bread, and a mountain pie maker. We've somehow misplaced our original mountain pie maker and were excited to find a DOUBLE capacity 'pie iron' at the sporting goods store in Idaho. I've got the cooking process down to a routine, beginning with buttering as much of the bread as possible. A spatula works much more effectively than a butter knife. Butter one side of each place of bread and stack them butter-sides-together for easy prep. Place the buttered side down into the iron before adding your filling, then top with the other piece of bread, butter side up! We enjoyed two consecutive nights of campfire cooking with pizza mountain pies for dinner and the sweet combinations for dessert. Aunt Katie was skeptical at first, but bought another double mountain pie maker the very next day! It takes just a few minutes to cook your mountain pie to golden brown perfection. Keep the cooker over the hot coals, staying away from the flames. Just 3 - 4 minutes on each side is perfect, although the burnt ones are delicious, too! 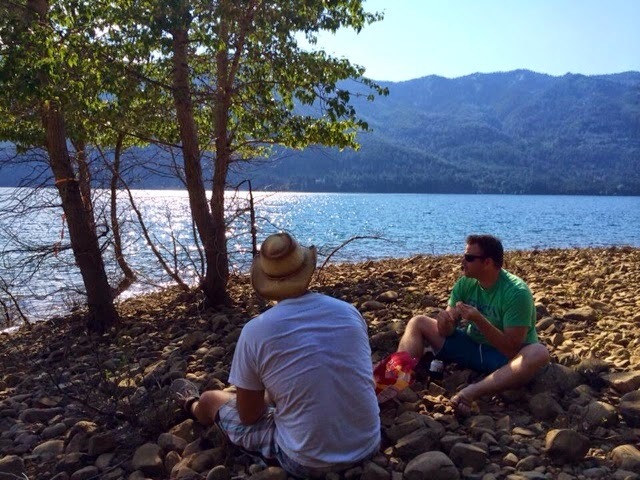 We truly camped just a week after our trip to Idaho. 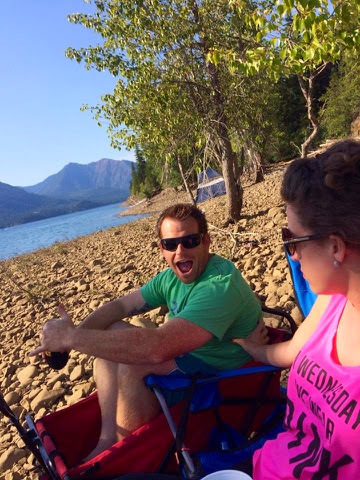 We stayed lakefront about a hour outside of Seattle with our friends. 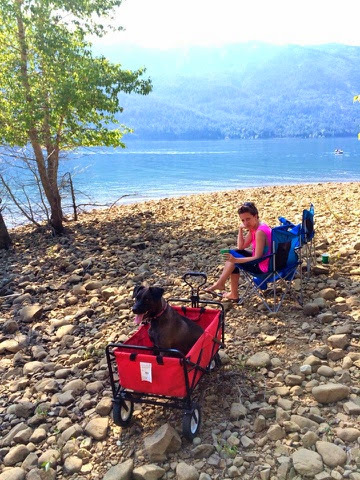 The terrain was very rocky and Bryce rested in the wagon to escape the rocks! He wasn't the only one to do so! That's April, our friends' pup. We snacked throughout the day and, of course, had mountain pies for dinner! I'm hoping to make mountain pies another time or two before the summer is over and I'm thinking that figs + brie cheese + honey would be excellent! Ooooh what about cheddar cheese and apple slices or tomato + mozzarella + basil. Would there really be a bad idea?! 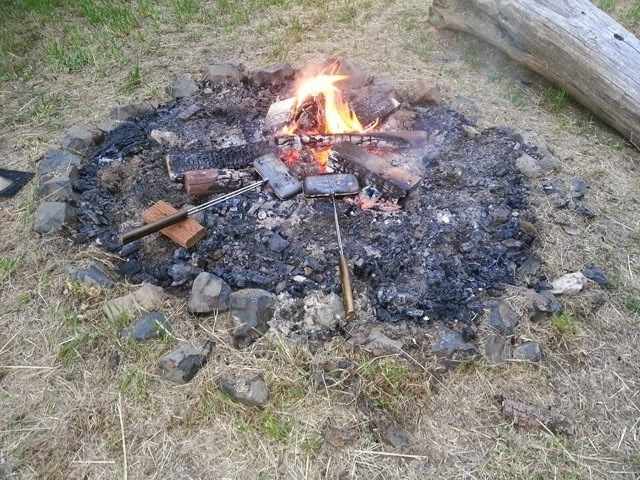 This summer hasn't been all fireside cooking, though. 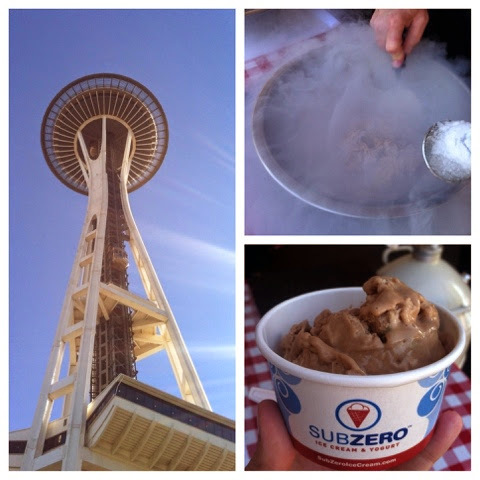 Just this week we had an employee picnic at the Space Needle where the ice cream was made from dry ice!